Be smart this summer. Take a summer class to get started or get ahead on your path to success. Hurry, early summer classes start on May 13. Get behind the wheel of this in-demand, high paying career. We are so proud of alumnus Hazim Hardeman who is featured in the article "North Philly to Oxford" on Philly.com. We invite you to share in his inspiring story, and follow him on his path to creating a more just world. Power Up Your Business is a neighborhood-based approach to support small business owners in Philadelphia—like you—to give you the tools you need to grow your business and help your community thrive. With more than 70 degree and certificate programs, affordable tuition and financial assistance opportunities, Community College of Philadelphia is the smart path to a bachelor's degree or new career. If you plan on earning your bachelor’s degree, save money by spending your first two years here. Use the links below to get started on your path to possibilities. Why wait? Apply online today. Complete our online admission application to start on your path to success. Prepare for a career in as a medical assistant in just TWO SEMESTERS. Medical assistants are a valued member of a health care team working in a variety of health care environments. Save money and get started on your path to a bachelor's degree with our transfer agreements and dual admission partnerships. View the 2018-2019 College Catalog for program requirements and other important information. I was very curious and terrified at the same time to start at the College—but I kept an open mind. When I walked onto campus, I was shocked. I thought it would be a lot smaller, but it’s huge! I love it! One of my professors is actually non-binary, and I’ve never met someone like that before. It’s very inspirational to be around different kinds of people to open my perspective. I love it here! After high school, I neglected the fact that ‘college is to further your education’. I just started working, but after a while you notice you’re living check to check, and having a career is a different thing. So, I ended up here at Community College. I’m 26 years old, and I’m happy to be here right now. My major is Engineering. 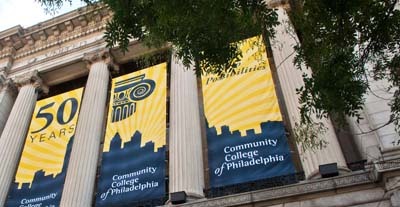 After I get my associate degree here at Community College, I can transfer to Drexel and continue my education there. I’m trying to decide between Civil and Electrical Engineering. I came to Philadelphia in 2017 because my husband is from Philadelphia. I started going back to university in Germany, but then I met him so I moved to Philly and started going to college here and I really enjoy it! I think the people are a lot nicer here in Philly than Germany. I really feel home—this is the first time in a while I feel at home. My major here at the College is Mass Media. I’m in the Dual Admissions program, so after here I’m going to go to Temple University and major in Journalism. My long-term goal is to become a newscaster, preferably for WHYY.